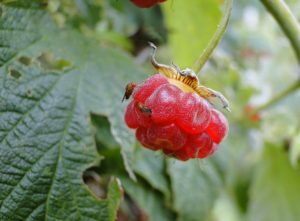 The Spotted Wing Drosophila is an invasive fly that poses a threat to soft-skinned fruit crops, such as berries and cherries. Since first detection in the United States in 2008, it has rapidly spread to become a pest across the country, with a huge impact on the production of susceptible crops. More information about the fly’s biology can be found on our Spotted Wing Biology Page. Do you have questions about Spotted Wing Drosophila? Our Frequently Asked Questions Page may have the answer. If you have management questions, see our Management Page for useful links or contact us. Our national team of scientists, with support from the USDA Specialty Crop Research Initiative, seeks to advance the development of sustainable, integrated management strategies for spotted wing drosophila, SWD, based on biology.